There are just eight days to go until the general election on 7 May. Are you still deciding on who to vote for, or do you want more details? BBC Election 2015 page under 'Find your constituency'. I also thought it was interesting when Norman Lamb answered the question on whether we need a train service from Norwich to London in 90 minutes. He said the main thing he wanted was a "reliable service". A sparky audience for tonight's debate. With the first question on immigration, and bearing in mind it was a balanced audience, there was anger with UKIP about its perceived views on immigration. There was a lot of applause when Rupert Read said the economic crisis was due to bankers not immigrants. Mr Read adds that he "wants to see a future where people are not in fear of immigrants". Andy Sawford (Labour) says we need to take a fair approach to public services which can be achieved through a Labour government. Douglas Carswell (UKIP) says so many things are better in this country because they have not been run by politicians. Norman Lamb (Lib Dem) says he sees the East as a "dynamic region" which can give good life chances to its young people to succeed. Elizabeth Truss (Conservative) says: "Norfolk is a fabulous county" and she wants it to continue to contribute to it. Douglas Carswell (UKIP) says he was concerned about apprenticeships becoming "an excuse to hire young people on low wages". He adds it is "important to build homes on brown field sites" and UKIP have put forward incentives to encourage this. Norman Lamb (Lib Dem) says former airfield sites could be used for new homes. He said new internships had been a success. Rupert Read (Green Party) says: "We believe 500,000 new homes should be built, this is social housing. "We need to end the Thatcherite madness of right-to-buy (with the selling off of council homes)." Audience member Colin Bye asks: "Young people growing up in rural areas of East Anglia face many challenges. What are the candidates proposals for developing jobs and homes for these young people into the future?" Elizabeth Truss (Conservative) says if you vote Conservative you will get to Norwich in 90 minutes "over the next five years". Andy Sawford (Labour) says Labour invested in Corby station and are committed to investments in the railways. Norman Lamb (Lib Dems) says it is essential they get "more investment". An audience member asks when will we be able to travel by rail to Norwich from London in 90 minutes. an issue of great debate in the East of the region for some time. A audience member asks if the panellists use the NHS: When asked to raise their hands - they all say they do and don't have a private health scheme. tweets: By the way .. @normanlamb came from London for #eastdebate. Then went back to London for #Newsnight. Says he's running on adrenalin..
Rupert Read (Green Party) said greater use of the NHS was partly due to people suffering the ill effects of air pollution. "Greens have a policy to tackle air pollution," he says. "Labour, the Lib Dems and the Conservatives have, bit by bit, been privatising the NHS." Mr Lamb says the NHS should not be a "political football" and he called for all parties to come together to find a solution to the problems of the NHS. Elizabeth Truss (Conservative) says: "We need to have GP surgeries open for longer. "We are pledged by 2020 to have them open seven days a week." She said that locally they are inter-grating surgeries with local hospitals and A&E departments. Norman Lamb (Lib Dem) says access to GPs is vital and "GPs are already coming together in federations so the service is shared." He says it is also important to recognise and fund mental health problems on a par with physical health. "We need to do far more," he says. From immigration the debate moves to the subject of the NHS. Retired nurse Leila Stubbs asks: "Should GP surgeries be compelled to open for longer, thereby relieving pressure on A and E departments?" Rupert Read (UKIP) says: "We believe in border controls." But he adds the real issue was to address the courses of the problems which he says has "environmental causes". Mr Read says the Green Party would also address another cause of the problem by providing "more foreign aid". Andy Sawford (Labour) says: "Immigration is a really important issue and a big issues on the doorsteps in my constituency. "It's more about the lower-skilled jobs... and the undercutting of wages." An audience member accuses UKIP of "scapegoating" immigrants. Mr Carswell responds: "Wanting a country to have control of its borders is not scapegoating." Norman Lamb (Lib Dem) says: "The issue has been kept under cover for far too long. We have to understand why people are concerned. "But we need a balanced discussion. "Something like 20% of those working in the health system are from other countries. The system would collapse without them." Douglas Carswell (UKIP) says it's "extraordinary how all three established parties... fail to address" the problem. "UKIP is promising real change," he says, with an Australian points-based system to allow in people with the skills needed for the economy. "The established parties sneering and jeering is just not good enough," he adds. Immigration is a key issue for many voters in the East region. Peter Thouless kicks of the questioning in tonight's debate, he asks: "Why is the important question on immigration not being answered by any of the 'deemed to be' major political parties?" 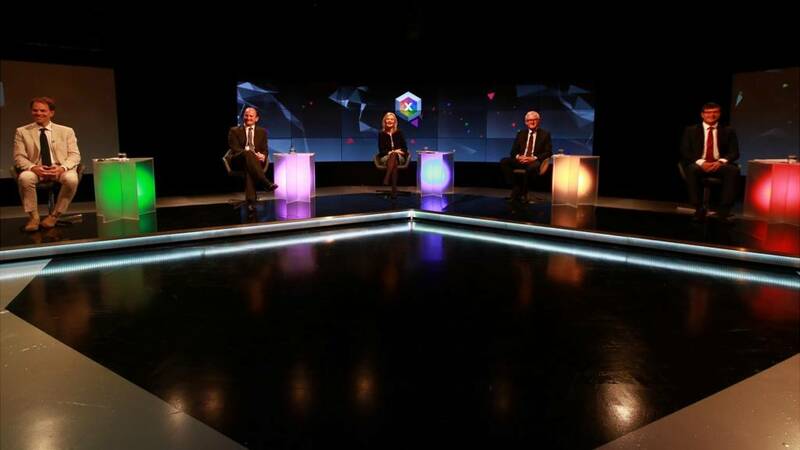 Key topics for BBC East debate are immigration, the health service and the acute shortage of GPs, housing and transport... but a bustling audience could bring surprises. On transport, calls are being made to bring down train times from Norwich to London to 90 minutes. Secretary of State for the Environment Elizabeth Truss was elected Conservative MP for South West Norfolk in 2010. The Oxford University graduate had previously served as an education minister. Andy Sawford won the Corby seat for Labour from the Conservatives in a 2012 by-election, caused by the resignation of novelist Louise Mensch. Mr Sawford's father Phil was the Labour MP for the nearby Kettering seat between 1997 and 2005. Academic and Green Party politician Rupert Read was a councillor for Norwich between 2004 and 2011. He lectures on philosophy at the University of East Anglia and is standing for the Cambridge seat. Lib Dem health minister Norman Lamb won his North Norfolk seat in 2001 from the Conservatives. He increased his majority from nearly 500 to more than 10,000 in 2005 despite a big Tory campaign to regain the target seat. The first elected UKIP MP Douglas Carswell, who turns 44 on Sunday, became Conservative MP for Harwich in 2005 and then Clacton MP in 2010. In August 2014 he defected to UKIP and resigned his seat, sparking a by-election. BBC election website for a full list of candidates in your constituency. Welcome to tonight's East live page special as candidates from across the region discuss how their party would deal with some of the election's key issues.